Desigual is one of the fastest growing global retail giants from Spain. It is a colorful brand with optimistic and energetic values – and its new e-commerce site needed to reflect that. A passionate brand with a disruptive style that celebrates fun and individuality. Desigual is known to be a fun and loud brand. The site design and photo shoots needed a clean look to let the expressive style speak on its own, all the while letting their brand values come through with fun cheeky models and tone. 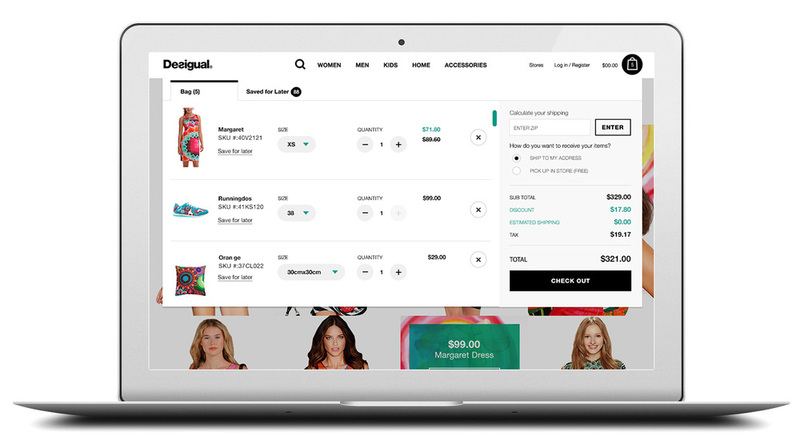 Desigual's photo shoots have been rethought to have video integration right from the search results page, pulling the users in with the energy of the brand. It's not about what you wear, it's about who you are, and Desigual celebrates that. Desigual's designs being so complex, it was necessary to offer users big visuals to see the details, without extra taps and barriers. The search bar became the product name. And with one swipe, users can move to the next product without going back to the search results page. Each product can be added to the bag with one rollover and a click without needing to go to the product detail page. Here we can see a module pulling in the Instagram API from which users can buy from real people submitting their photos through a hashtag and modeling in the clothes. We all know how it feels to open new tabs to view our shopping cart on the side as we're browsing. By integrating the cart as a fly-in to the page, we minimize the frustrations and let users browse and access the cart comfortably.